The word Columbarium is derived from the Latin word 'Columba', dove, a symbol of God's Spirit and peace. Historically, the Church has laid its beloved dead in Church yards and consecrated places. In keeping with this tradition, St. Mary's created a columbarium as part of the construction of the Daily Mass Chapel. 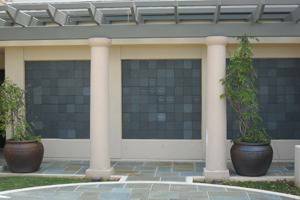 The Columbarium at St. Mary's is located within the Consolation Garden beside the front entrance to the Church. In the garden is a life-sized statue of the Blessed Mother. The statue, created by Brother Joseph Aspell, depicts the Blessed Mother gazing at the crown of thorns. Her grief as she mourns the deather of her beloved son is evidenced upon her face. Strengthened by the grace of God, however, she opens her hands in a gesture of compliant acceptance of God's plan. Ultimately, her belief that Jesus conquers death will grant her deep peace. Grief at the death of a loved on is inevitable. 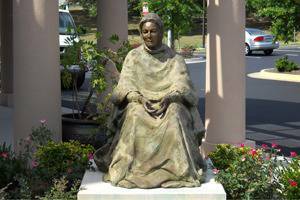 This statue reminds us that, like Mary, we are invited to move from grief to peace. St. Mary's offers both a Single Niche and a Double Niche. The purchase price includes the urn to receive the Ashes, use of a walnut ossuary for the funeral service, opening and closing of the niche and engraving of the family name and appropriate dates on a bluestone face plate. Spaces within the Columbarium are limited.